Hazelnut trees are available for sale for both growing nuts and as a host for truffles. They can be dense growing so make an interesting hedge or screen. Lambert is perhaps one of the heaviest cropping varieties. 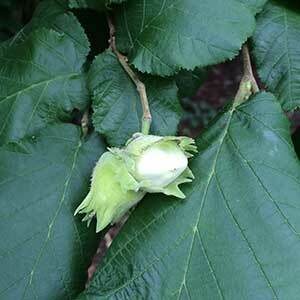 Being an easy tree to grow Hazelnut trees are popular in home and community gardens. Most are pruned to a single upright trunk with the exception of ‘Wanliss Pride’ (also known as American White) which is treated more as multi stemmed bush. Grown mainly for the nuts, Hazelnut trees can also be used as an ornamental tree and sometimes as they tend to sucker as a fruiting hedge. If left tom grow as a tree they will reach around 3 – 6m in height. Nuts are ready to harvest in late summer. Hazelnut trees perform best in a cool climate in a sunny position. Grafted varieties need to be planted with the graft above the soil level. A humus rich deep soil. Mulch to maintain moisture through summer as Hazelnut trees are shallow rooted. Hazelnut trees are best pruned after planting to encourage new growth and a bushy habit. Wanliss Pride is a heavy producer with large nuts. Hazelnut trees flower in winter with both male and female flowers on the same tree. As they tend to flower are different times you will need two varieties for successful pollination. Remarkably problem free, sometimes bacterial blight may cause problems, however usually easily controlled with a copper sulphate spray.